Or view larger version. Two Japanese American children in Hayward await relocation. May 8, 1942. Dorothea Lange, photographer. Gelatin silver print. Collection of Oakland Museum of California. Gift of Paul S. Taylor. 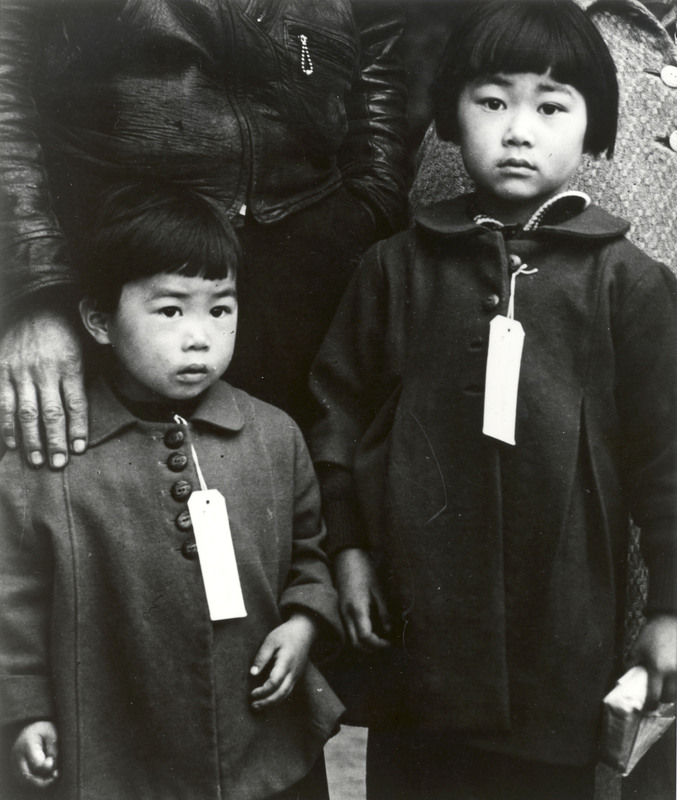 During the evacuation process, Japanese Americans families were registered and given numbered tags to identify themselves and their belongings. Gathered in groups of 500 at designated locations, they were then transported to various assembly centers on buses and trains accompanied by armed military guards. Recalling her experience as a child in the PBS documentary, Children of the Camps, one former internee said, "I remember the soldiers marching us to the army tank and I looked at their rifles and I was just terrified because I could see this long knife at the end . … I thought I was imagining it as an adult much later . … I thought it couldn't have been bayonets because we were just little kids."